Happy Birthday, Anne Hathaway! The Academy Award-winner turns 35 on November 12th, and though she hasn't been seen onscreen this year, the actress, who Mr. Valentino and Mr. Giammetti consider "like a daughter," will be back in theaters with a bang in 2018, starring in the sure-to-be-blockbuster Ocean's Eight, among other films. 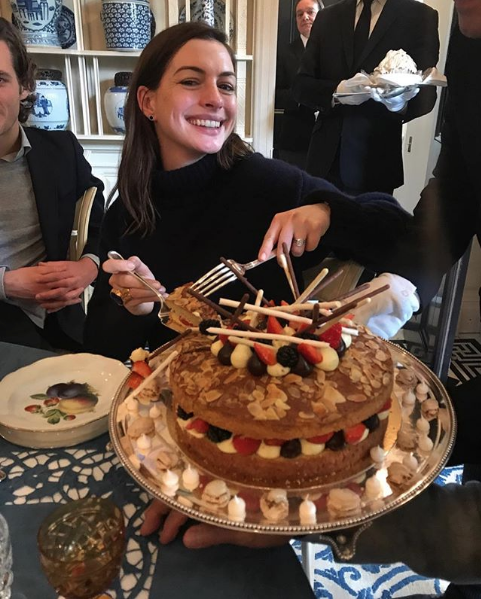 Hathaway recently took a break from shooting the comedy Nasty Women in Mallorca to join Mr. Giammetti for brunch in London. It was just the latest in a long line of Hathaway hangs for Mr. Giammetti and Mr. Valentino: A frequent guest on the TM Blue, Hathaway's friendship with the pair was inscribed into Oscar history when she was joined on the red carpet by Mr. Valentino at the 2011 Academy Awards. She's been their date to the Met Gala—in 2013, she turned up in vintage Valentino from the Fall 1994/95 haute couture collection, and she and Mr. Valentino and Mr. Giammetti have demonstrated their mutual love and support by turning up at each other's movies premieres. In 2010, for instance, Mr. Valentino was there to cheer on Anne at the premiere of Love and Other Drugs—just as she'd cheered him and Mr. Giammetti on a year earlier, at the New York premiere of Valentino: The Last Emperor. A class act, Hathaway is just getting better with age. Many happy returns!